A few days ago, a friend who works in the US time zone came for a sleepover. And as girlfriends would, we had a “yap till you can yap” session, post which she checked her Facebook before retiring for the night at 3.30AM. She read reports that Nicolas Cage passed away in a motorcycle accident. While she showed the picture of a bad crash on her mobile screen, I mumbled something from under my blanket that it might be a hoax. She didn’t find any information about the picture and clicked the READ MORE link only to find there was no relevant information to support the story. An avid Facebooker, she did not want to miss writing condolences on her Facebook page on this incident. So, she Googled it and when she didn’t find any backing information, grudgingly gave it up. The following morning, her phone continued to buzz loudly at 6AM. A friend woke her up to ask her as to why she was posting deaths of celebrities on her Facebook page. Startled, my friend woke up to log in to Facebook to see that she had actually posted that US actor Nicolas Cage had died in a motorcycle accident. Not just that, it was followed by another post of Rowan Atkinson, the famous Mr. Bean having killed himself. My dear friend’s Facebook page was posting celebrity death hoaxes on other’s page too. How did this happen? She claims that she didn’t share any of those, but it was right there on her page. A popular and easy way to gain people’s attention is to post horrendous information about celebrities and people take the bait easily. While you are worried about your favorite star, Nicolas Cage’s health and happiness, or even jealous about Bipasha Basu’s second honeymoon, know that the photographs accompanying most of these reports are stolen from random incidents/doctored from previous photographs of the stars. If you click on the post in the hope of reading more information, you are taken to a suspicious website with many CLICK HERE links. Some links show a ‘play’ button on a video with the celebrity’s image, clicking on which will lead to more spamming websites. Several antivirus/software downloads, adult websites, online gaming sites, get-rich-quick schemes glean your personal information, install virus or trick you into paying/downloading unwanted software by the above methods. Celebrity death hoax news websites like the ones included above are common. Many of us are wary of such reports and we do the customary verification on Google and other trusted sources. And this is what exactly my friend had done. But how did these posts find a way on her Facebook page, when she had actually not shared it. The terrible truth is, she did not share it, but she had let the site share information on her behalf. How does this work? This app uses my basic profile info, can look at my Friends List (can be disabled) and use my email address to send me promos/other information. 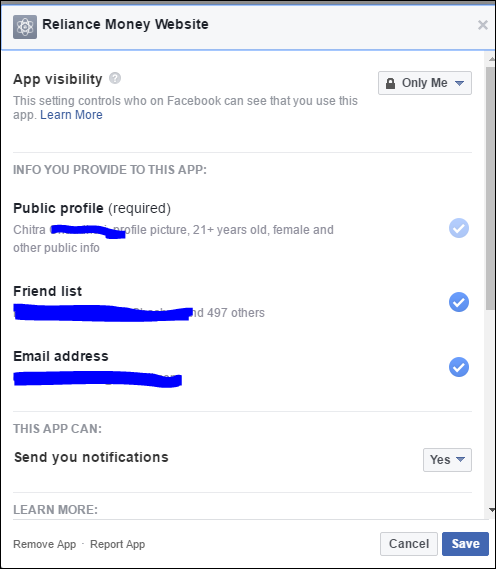 Here’s another that looks for more than my public profile, notice that a ‘blue tick’ on the right indicates that you are permitting the app to use that information from your Facebook profile. Now this seems like a decent set of requests, as on Quora I would like to connect with people who are part of my friends list or people who I share some work/education background. These are apps that use your information for their own use. 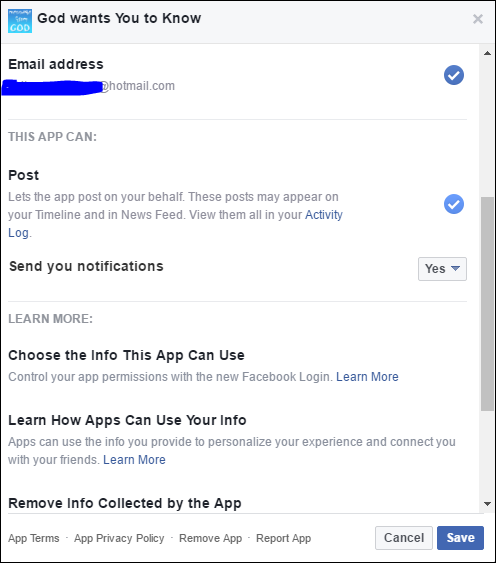 Selecting (Clicking) the option: “Let the app post on your behalf…View them all in your Activity Log.“ is how my friend was able not only to see the celebrity death hoax messages on her page/Activity Log but also post it on her Friends’ and probably Friends to Friends pages as well. 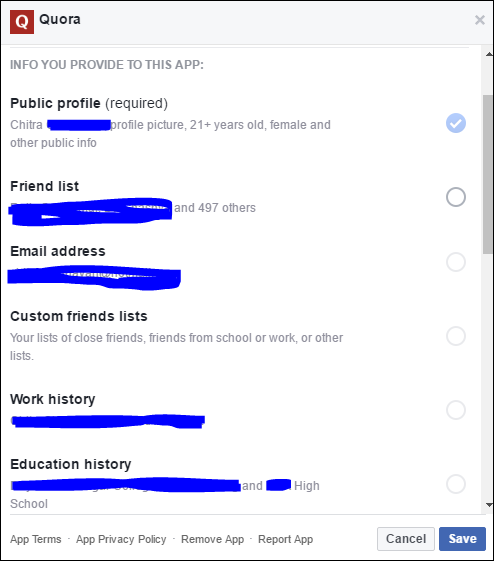 So, the next time you like a new page, go to Facebook App Settings and understand how these apps access your friends list and any information you choose to make public. 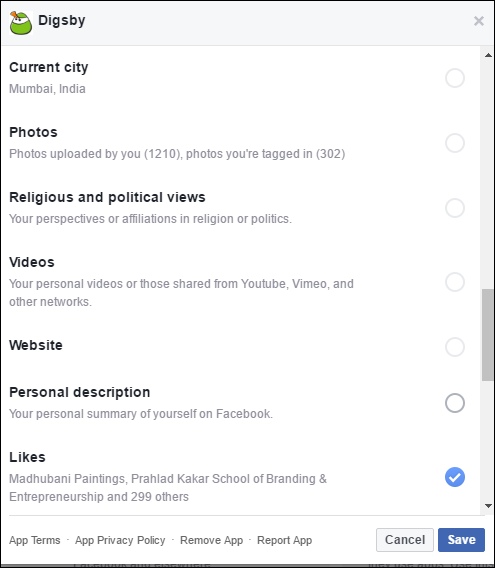 This entry was posted in Uh-Social and tagged AppSettings, Data, Facebook, Protection by chitrachaudhuri. Bookmark the permalink.